Los Angeles, CA (March 28, 2019) – On Sunday, March 31, 2019, Season XVII of the World Poker Tour® premieres on FOX Sports Regional Networks on stations across the U.S. The season starts at Commerce Casino for the LAPC Rockstar Energy High Roller with Tony Dunst joining Vince Van Patten in the commentary booth for the second season in a row. The first part of Season XVII of the WPT® television show will feature 24 episodes of poker television programming across seven unique events, including the first-ever WPT cash game, and the debut of the ClubWPT Challenge the Champs show. The season moves from Commerce Casino to Uruguay and Enjoy Punta del Este for the first-ever televised WPT event held in South America. Next, the WPT television cameras return to Commerce Casino for the WPT Rockstar Energy Cash Game. This high-stakes cash game features an amazing lineup of celebrities and Champions Club members, including actress Jennifer Tilly. The WPT Rockstar Energy Cash Game is the first cash game ever broadcast on the World Poker Tour. Another High Roller event is on the Season XVII schedule when Bellagio returns to the World Poker Tour television stage. The Bellagio High Roller starts at Bellagio and completes its star-studded final table at HyperX Esports Arena at Luxor Hotel & Casino in Las Vegas. 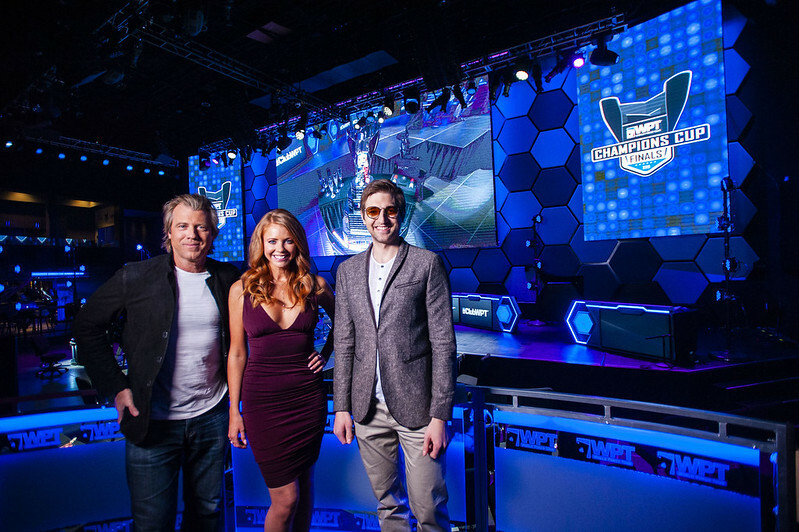 The WPT stays in Las Vegas for the WPT Vegas Cash Game, filmed at HyperX Esports Arena. The biggest winner of the WPT Rockstar Energy Cash Game and the WPT Vegas Cash Game each receive a Hublot Big Bang Steel watch. ClubWPT Challenge the Champs is next on the schedule at HyperX Esports Arena. Two ClubWPT qualifiers square off against six WPT Champions Club members including Mike Sexton, four-time winner Darren Elias, and Scotty Nguyen. Tony Dunst and Vince Van Patten partner once again in the WPT commentary booth for Season XVII. Van Patten is on the call for his seventeenth season and Dunst sits down for his second campaign. Lynn Gilmartin anchors the show. Season XVII is the sixth season Gilmartin has served as WPT Anchor. Phil Hellmuth rounds out the group as host of the WPT Raw Deal segment. Hellmuth premiered in his new role in Season XVI, replacing Dunst. New episodes of the WPT premiere each Sunday on FOX Sports Regional Networks at 8/11 p.m. local time, and each episode will re-air throughout the subsequent week. Be sure to check your local listings for more information. The schedule for the second part of Season XVII will be released at a later date. World Poker Tour (WPT) is the premier name in internationally televised gaming and entertainment with brand presence in land-based tournaments, television, online, and mobile. Leading innovation in the sport of poker since 2002, WPT ignited the global poker boom with the creation of a unique television show based on a series of high-stakes poker tournaments. WPT has broadcast globally in more than 150 countries and territories, and is currently producing its 17th season, which airs on FOX Sports Regional Networks in the United States. Season XVII of WPT is sponsored by ClubWPT.com. ClubWPT.com is a unique online membership site that offers inside access to the WPT, as well as a sweepstakes-based poker club available in 35 states across the United States. WPT also participates in strategic brand license, partnership, and sponsorship opportunities. WPT Enterprises Inc. is a subsidiary of Ourgame International Holdings, Ltd. For more information, go to WPT.com. This communication contains “forward-looking statements” within the meaning of Section 21E of the Securities Exchange Act of 1934, as amended, and the Private Securities Litigation Reform Act of 1995. Forward-looking statements may relate to the proposed transaction (the “Proposed Transaction”) between WPT’s parent company, Ourgame International Holdings Limited, and Black Ridge Acquisition Corp. (NASDAQ: BRAC) and any other statements relating to future results, strategy and plans of Black Ridge and Ourgame (including certain projections and business trends, and statements which may be identiﬁed by the use of the words “plans”, “expects” or “does not expect”, “estimated”, “is expected”, “budget”, “scheduled”, “estimates”, “forecasts”, “intends”, “anticipates” or “does not anticipate”, or “believes”, or variations of such words and phrases or state that certain actions, events or results “may”, “could”, “would”, “might”, “projects”, “will” or “will be taken”, “occur” or “be achieved”). Forward-looking statements are based on the opinions and estimates of management of Ourgame as of the date such statements are made, and they are subject to known and unknown risks, uncertainties, assumptions and other factors that may cause the actual results, level of activity, performance or achievements to be materially different from those expressed or implied by such forward-looking statements. These risks and uncertainties include, but are not limited to, its revenues and operating performance, general economic conditions, industry trends, legislation or regulatory requirements affecting the business in which it is engaged, management of growth, its business strategy and plans, the result of future ﬁnancing efforts and its dependence on key personnel, the successful combination of Black Ridge with Ourgame’s business and the ability to retain key personnel. Readers are cautioned not to place undue reliance upon any forward-looking statements, which speak only as of the date made. These forward-looking statements are made only as of the date hereof, and Ourgame undertakes no obligations to update or revise the forward-looking statements, whether as a result of new information, future events or otherwise, except as required by law. Black Ridge and Ourgame, and their respective directors and executive ofﬁcers, may be deemed participants in the solicitation of proxies of Black Ridge stockholders in respect of the Proposed Transaction. Information about the directors and executive ofﬁcers of Ourgame and more detailed information regarding the identity of all potential participants, and their direct and indirect interests, by security holdings or otherwise, are set forth in Black Ridge’s preliminary proxy statement which has been filed with the SEC. Investors may obtain additional information about the interests of such participants by reading such proxy statement at the SEC’s website at www.sec.gov. ©2019 WPT Enterprises, Inc. All rights reserved.